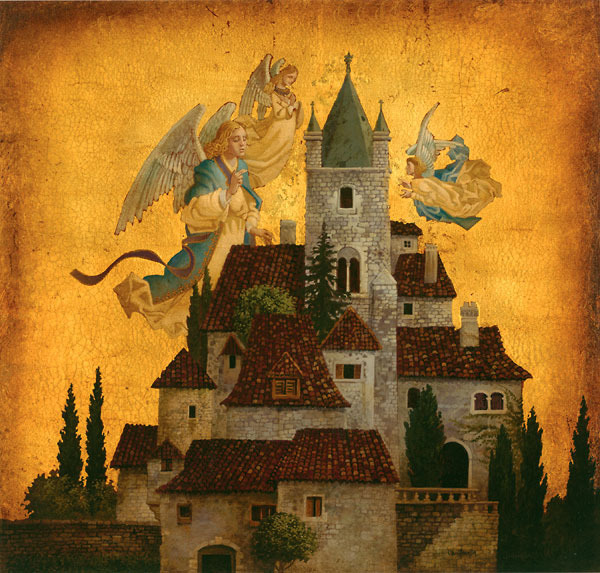 While traveling in Umbria this past summer, artist James Christensen was inspired by the architecture of the region, the "piled and stacked buildings" of the hill towns. He filled his sketchbooks with Italian landscapes and cityscapes such as the one found in his newest piece, Angels of My Village. The illuminated landscape and hand-layered gold leaf of the painting call to mind the angels found in medieval manuscripts. "In my mind," says Jim, "it was kind of a thank-you painting for the feelings that we're not alone. I think we need to remember that we do have angels watching over us. Even if you live in New York City, you have your village. I know every single person within three blocks of me. We help one another and are the angels for one another. We are the angels of our villages."